Preah Khan temple - by bike. 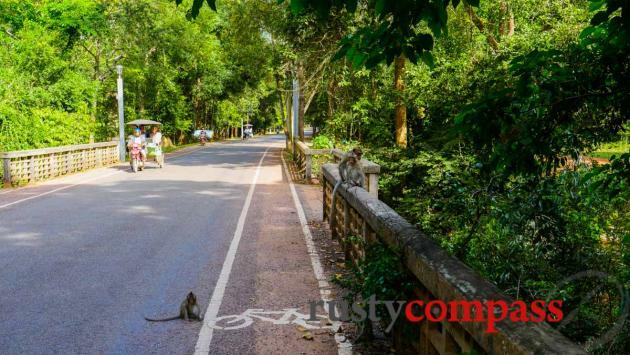 If you like cycling, exploring the temples of Angkor by bicycle is a delight. In fact, we reckon this is the best way to experience Angkor. Spend two or three days (or longer) and you’ll get a real appreciation of the incredible beauty of the temples and their stunning setting. The terrain is mostly flat, the cycling paths are pretty good and the traffic is mostly light. And you can tailor your cycling to your fitness level. 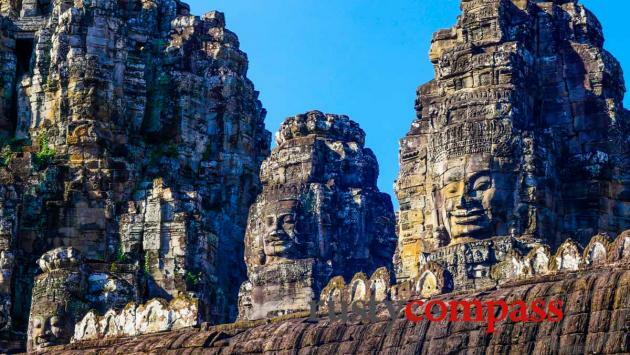 Exploring the main temples by bicycle (Angkor Wat, Angkor Thom, Bayon, Ta Prohm) is easy and can be done by anybody of reasonable fitness and cycling experience. Expect to cycle between 40 and 50kms along mostly shaded marked bicycle paths. These are the most busy temples with tourists so the roads are busier too. We’d recommend visiting other temples in addition to these. If a temple's too busy, come back later. There are temples everywhere. Stop at the lesser known ones and explore. Depending on how much doubling back you do, this ride will be between 35 and 50kms. Allow a full day and linger at the temples. 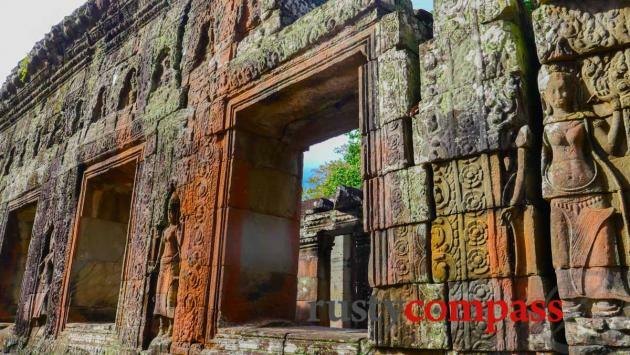 Estimate 55 to 65kms - more than 100kms if Banteay Srei is included. I enjoy these temples more than the most popular ones listed above. They tend to be less crowded and they are in many ways equally beautiful. The fact that they are quieter means you can have a much more intimate experience. Riding in this area is also more beautiful. You’ll pass small villages and rice fields. The traffic is light too. Fit cyclists can consider heading to to more remote temples. 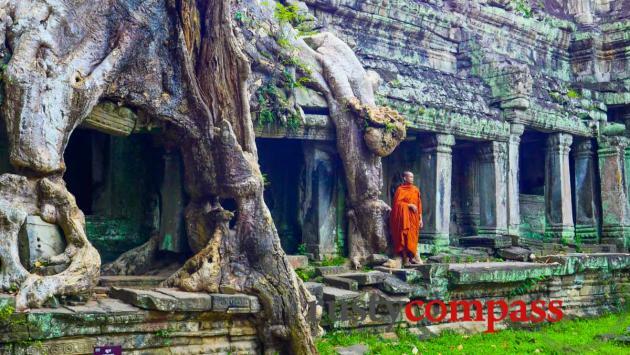 There are temples scattered for hundreds of kilometres around Siem Reap. Banteay Srei (46kms) is one of the most visited temples and considered one of the most beautiful - it can get busy. From Banteay Srei, Phnom Kulen National Park with the sacred Kulen Mountain is only another 10kms on. 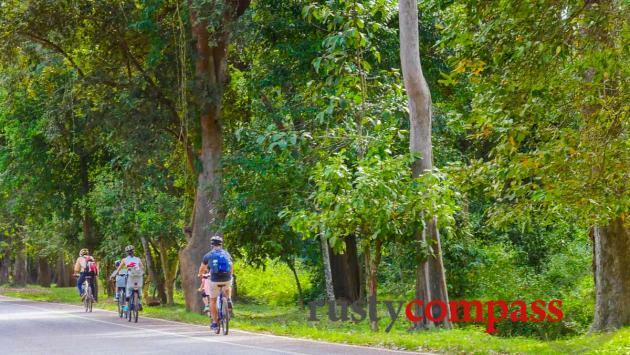 If you’re feeling up to cycling 180kms, you could loop around from Phnom Kulen to Boeng Mealea - and then back to Siem Reap. 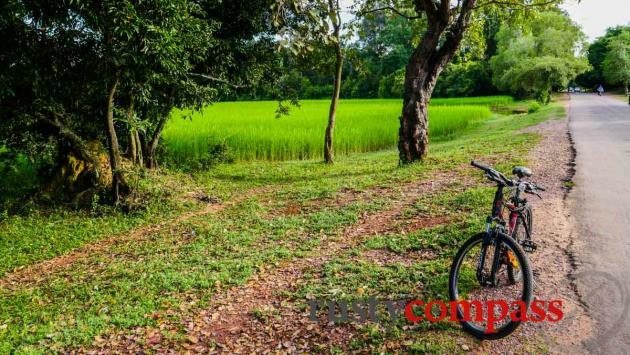 It’s also possible to cycle to Boeng Mealea as a single cycling trip. Boeng Mealea is worth the effort - providing it’s not swarming with tourists - as happens sometimes these days. 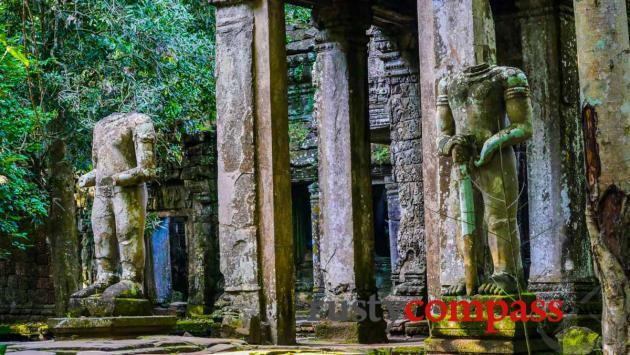 It’s also possible to do a very interesting (long) ride to Boeng Mealea that includes the Roluos Group temples and then loops back from Boeng Mealea to Siem Reap via the main temple complex. We have not cycled to Boeng Mealea so the recommended route has not been tested. There’s a good range of bikes available for hire in Siem Reap. Basic bikes which are fine for very casual cycling are available for around 2US per day. Larger framed road bikes with gears are available for around 4US per day. These tend to be in mediocre shape - but they’re fine if you’re not in a hurry. I got mine from Luy Kongheng Company at 247 Pokambor Ave. The bikes were OK - not well maintained. But they served me for 4 - 5 days without a problem. I spotted other companies around town offering rentals as well. If you’re a more serious cyclist, Grasshopper Tours rent their new high quality mountain bikes out for 10US per day. Make sure you have your ticket before you embark on your big cycling mission. You can only get your tickets from the Apsara Rd ticket office. And you’ll need one to do any of these rides and access the temples. If these rides look too long, you can cut them in half by throwing your bike in a tuk-tuk or van, travel to the furthest point and then ride back. It’s a great way to enjoy the beauty of cycling while ensuring you have plenty of temple time and you’re not completely shattered at the end of it all. Tuk-tuk’s seem not to be very accustomed to this and you won’t be able to strap more than 2 bikes to a tuk-tuk. And you’ll need to arrange this first. Another options is to have a van take you to Boeng Mealea and ride back through the main temple complex - it’s still going to be around 80kms of cycling. Or have a van or tuk-tuk take you to Preah Khan and make your way back via the temples you most want to see. The route between Preah Khan and Ta Som and on to Banteay Kdei is through beautiful rural countryside. It’s also worth remembering that the temples are at their best in the early morning and late afternoon. Riding back from the temples in the dark isn’t so much fun (can be dusty and busy) - another reason for considering having some transport available. The cycling may be good but the whole point of these rides is to explore the incredible temples. Make sure you allow plenty of time for temple exploration and factor this into your fitness calculation. When you get off your bike you’ll be still on your feet. Some of these rides are very long - only for the fittest. Take note of our recommendation to think about taking a van or tuk-tuk to a temple and then riding back. Cycling in the cool of morning and afternoons is best. The heat is especially oppressive between February and May - and before the rains, the dust is even more oppressive. We’d suggest giving cycling a miss during these months - more because of dust than heat. 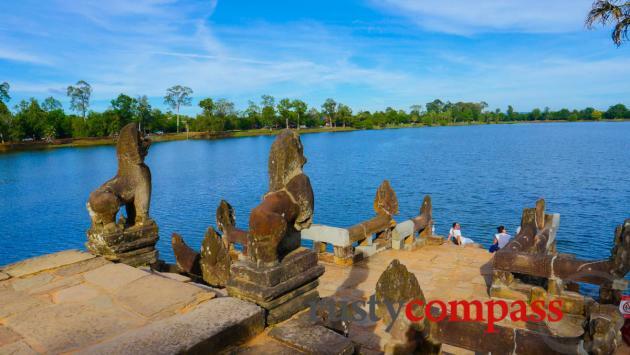 We suggest spending full days at the temples, rather than coming back to Siem Reap. Take a big break during the hottest parts of the day over lunch and bring a good book. The setting is perfect for chilling. There are now quite a few restaurants around the temples. We spotted a bunch overlooking Srah Srang. You can also pack something from Siem Reap if you’d prefer. There are also local eateries scattered around the countryside for longer rides. If you’re travelling during Christmas and New Year, or during Chinese or Khmer New Year - or at any other major holiday, you’ll need to be more flexible about your cycling plans. The advice given above will work for most of the year, but when the temples are at their most crowded, cycling conditions will definitely be less pleasant. 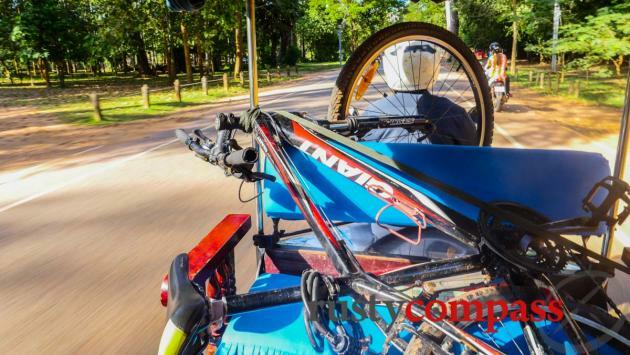 A number of companies offer cycling tours in Siem Reap. We’ve only cycled independently but these two companies have been recommended by friends and travellers. Let us know if you know of more. Grasshopper Adventures run cycling day tours across Asia and research interesting itineraries. They use good quality bikes and guides. We’ve not used them in Siem Reap but have travelled with them in Phnom Penh in the past. 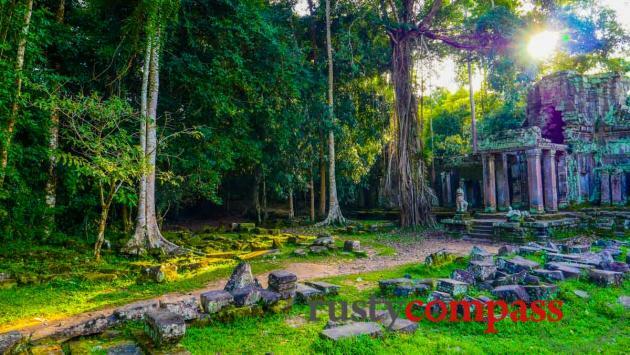 You can check out their Angkor tours here. We’ve also heard good things about Cambodia Cycling and Khmer for Khmer tours (an NGO that operates tours). You can check them out here. 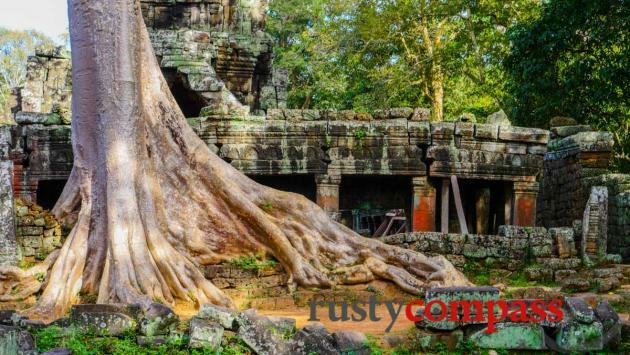 Unique ideas for the curious traveller to Siem Reap by Rusty Compass.